While the hedge fund proudly reports a salubrious 9.6% return after fees, as you can see in the table below, the investor will only be left with 2.9% after taxes. That’s an effective tax rate of 70%. Ouch! The wedge turns into an iceberg at lower gross returns. For example, if the hedge fund had a gross return of 8.5% that would leave just 0.5% for our investor, and she’d be singing the same despondent tune as the Beatles under the 1966 Labour government’s 95% tax rate. Meanwhile, the tax efficiency of long-term investing in the public equity market was left mostly intact by tax reform, or even slightly improved with the lower effective individual tax rate on public market pass-through vehicles, such as REITs and MLPs.6 Investors did have a momentary fright from the Senate’s “FIFO” proposal, dropped at the 11th hour, which would have taken away the benefit of choosing specific tax lots on sales. An equity market return of just 4.5% in the form of long-term capital gains and qualified dividends would deliver the same after-tax return to our investor as the hedge fund earning 15% before fees and taxes. 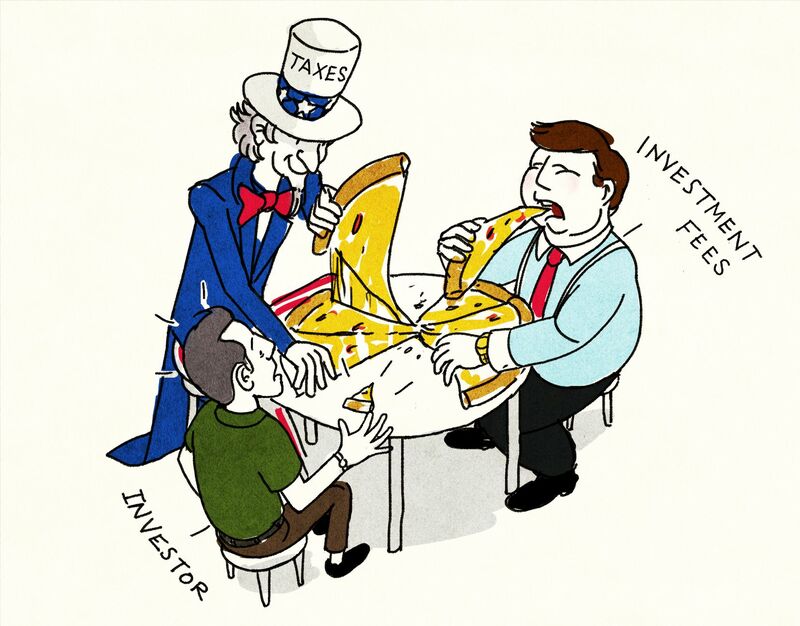 The wedge widens significantly further when we consider the value of tax deferral in long-term equity investing,7 and the fact that neither the IRS nor most hedge fund managers return previously paid taxes or incentive fees when you have investment losses. Conclusion: taxable investors must expect incredible outperformance to close the after-tax return gap between high fee, tax-inefficient alternative investments and long-term investing in public market equities. While the Beatles had to leave the UK to avoid being left with one Shilling on a Pound of their income, U.S. taxable investors who want to keep a higher fraction of the gross return on their capital can achieve that goal without ever leaving home. Thank you to Larry Hilibrand for his always-helpful comments. The authors are not tax experts. This should not be construed as tax advice. This is an illustrative example. The tax characteristics of different private investment vehicles vary widely, and some may be quite tax efficient. However, what we present here is a relatively common case, and by no means the worst case. 37% Federal, 12.7% NY State & City + 3.8% Obamacare Investment Tax = 53.5% top marginal tax rate for NYC residents. The rate is 40.8% for investors who live in states with no income tax. This is an even bigger issue with investments such as private equity and venture capital that charge management fees on capital committed but not drawn in the early life of their funds, resulting in a non-deductible expense that is very large as a percent of average capital invested. These deductions were excluded under the prevailing AMT rules before the recent tax changes. While the cut in the U.S. corporate tax rate from 35% to 21% was a tremendous improvement in the overall tax efficiency of stock market ownership, our analysis in this note is focused on direct taxes paid by individual high-tax-rate investors. Deferral has several potential benefits: 1) compounding at the pre-tax rate and paying tax at the end is better than compounding at the after-tax rate, 2) appreciate assets can be donated or bequeathed without paying capital gains tax, and 3) investors tend to retire to lower-tax states. See our note from November 2015 for more detail.